P0960. 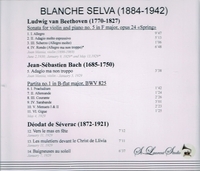 BLANCHE SELVA: Partita #1 in B-flat (Bach); Vers la mas en fête; Les muletiers devant le Christ de Llivia; Baigneuses au soleil (all de Séverac); JOAN MASSIA: Adagio ma non troppo (Bach), all recorded 1929; BLANCHE SELVA & JOAN MASSIA: Spring Sonata #5 in F (Beethoven), recorded 1929-30. (Canada) St Laurent Studio YSL 78-103. Transfers by Yves St Laurent. “Blanche Selva, one of the most revered of French pianists of her generation, made pitifully few recordings and even those were compressed into a two-year period. Her discography in fact amounts to no more than a mere eleven works, three of them in collaboration with the Catalan violinist Joan Massia (two of which are here). Six of the eleven were of works by Déodat de Séverac – who still retains a tentative toe in current discographic waters – two were by Bach, two by Franck and one by Beethoven. Trained at the Schola Cantorum, Selva was appointed by d’Indy himself as teacher at the early age of eighteen. In all she taught there for twenty years and was adventurous enough to add her own twist to the usual continental drift westwards of Czech musicians – Selva herself moving to Prague to teach; (while so many others were off to Paris) and encountering Suk and Novák along the way. She was a front rank exponent of Albéniz and d’Indy himself. She gave the complete Bach keyboard works as a cycle (beginning in Paris in 1904 and a number of times afterward) as she subsequently gave the complete ‘32’ of Beethoven on several occasions. She settled in Catalonia in the mid-twenties but suffered a stroke shortly after making some of the discs to be heard here and from then her concert-giving days were over. She left Barcelona – where she had taught – after the Civil War and died pretty much forgotten in France in 1942. Her Bach Partita is a precious souvenir of her playing. The Prelude is limpidity itself and the clarity and pointing of the stylish and apt Allemande truly impressive. Her chordal weighting in the Courante and her rather cool undemonstrative musicality all point to a major Bach player of the most august French school. The dynamics of the concluding Fugue are splendidly controlled and her ‘throwaway’ ending insouciant in the extreme. Selva was long a proponent of the music of the Languedoc-Provencal composer Déodat de Séverac and even wrote a biography of him. She revels in his fresh air impressionism – how elliptically she points the end of ‘Baigneuses au soleil’ and how charmingly she vests ‘Vers le mas en fête’ with such drama and such colour. To the mild exoticisms of ‘Les muletiers devant le Christ de Llivia’ can be added Selva’s own virtuosity and flair for colouristic potential – and she somehow ties the work to its Franckian antecedents with the simplest of inflexions.